I am using Spectravue as SDR software because it gives me best performance for my goals. I also tried other SDR software but in my opinion these have less possibilities in averaging or choosing very narrow Bandwidth. For solar noise or moon noise measurements, Spectravue has a feature other SDR software don't have. It is the Continuum mode and with this it is very easy to make accurate measurements on noise levels. On the other side one needs to be sure that the noise of the pre-amp used is clearly visible on the Spectravue display. When switching on and of the pre-amp I would like to have a least 20 dB or more rise off the noise floor shown on the Spectravue display. Be careful however, when the IF feeding the Funcube with high gain in front that the bandwidth of that signal is not extremely wide. the total power from that 1000 MHz noise is already causing compression in the Funcube. When the Funcube is entering non linear mode it is no longer possible to measure a small increase in noise power at the input. I had to put a 30 dB attenuator between the PLLLNB and the Funcube to make good solar noise measurements. but I have chosen to use an external attenuator to be sure that my Funcube is not entering compression. If one is using a transverter between the Funcube and the Pre-amp for instance a DB6NT transverter from 10 GHz to 432 MHz it is not needed to use an extra attenuator. The IF bandwidth of the transverter is limited to several MHz and the total power level entering the Funcube will not get it into compression. 10 log 1000/5 = 23 dB more power from the PLLLNB. Hope it's clear that this large IF bandwidth can cause compression in the Funcube. the Funcube has to deal with 23 dB more input power on its input. to the Funcube or the other option use an external attenuator. if you use a step attenuator and increase the signal by 10 dB the display level should also increase by 10 dB. If the displayed level on Spectravue is increasing less than 10 dB there is a good possibility the Funcube is out of its linear mode. You should add extra attenuation, but also check if the noise floor rises by at least 20 dB if you turn on the pre-amp. 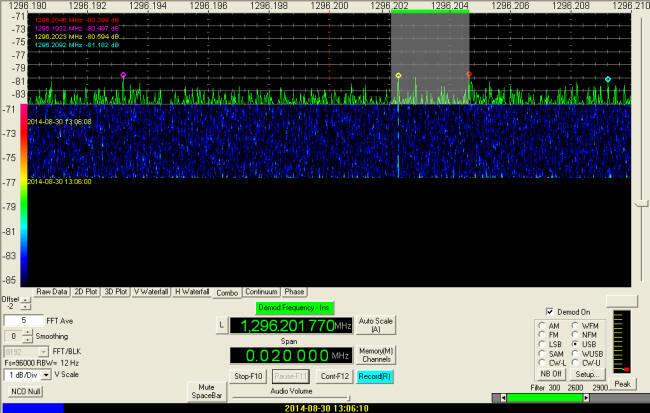 Turning the antenna to a cold sky spot and then turning it to the moon or sun will give a rise of measured noise level. If the difference is relatively small one can increase the vertical scale. Most of the time I use 0.5 or 1 dB/div but with the very small difference a scale of 0.1 dB/div will be helpful.